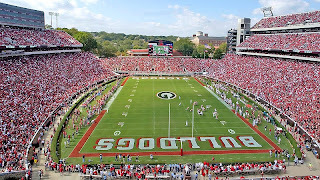 Georgia Sports Blog: Vol Fan says "Buy My Loyalty"
Vol Fan says "Buy My Loyalty"
"The winning bidder will get to pick my new favorite College team. I will root loudly and enthusiastically for my new team for the remainder of the 2005-2006 season (If in a Bowl game) and the entire 2006-2007 season." The bidding is now up to $685.00. Among the services he will buy to support his new team will be car flags, jerseys and a year long blog for the new team. He says that he has already been interviewed by WBIR and WVLT tv stations in TN. His future blog will be called WWW.PIMPDAFAN.COM. The site isn't active yet. When it is, i'll link over. Seeing the Vols in turmoil is flat out good times. Link found by ELDawgy from The Porch.